Wednesday night saw Bilsthorpe inflict only a second Central Midlands League Black Dragon North defeat of the season on leaders Clay Cross Town by three goals to one, all the goals coming in the first half. Liam Black was the star for Bilsthorpe, scoring a hat-trick with Ritchie Matthews getting one back for the Millers. The result moves Bilsthorpe up to third, five points behind the leaders, but with four games in hand. 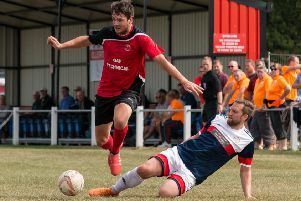 Ollerton Town scored three times in the first 14 minutes in their match with bottom side Welbeck Welfare through Liam Carver (2) and Kye Pilmore, but to the visitors’ credit the threatened avalanche of goals failed to materialise. Ricky Marsh pulled one back in the second half, but Pilmore had the last word in the last minute with his second of the match. There were a couple of significant results at the top end of the Black Dragon Badges North this week. On Tuesday night Westella VIP played one of a long list of remaining home fixtures, but dropped two points after a 1-1 draw with Appleby Frodingham. Daniel Barrowcliffe gave Frod the lead, the hosts equalising through a Chris Spinks penalty in added time at the end of the first half. That was the end of the scoring, the two sides cancelling each other out in the second period. Belper United reached their third successive League Cup semi-final with a 4-2 win over visitors Hucknall Rolls Leisure. Sam Vickers put Belper two up before the break, Rolls not helping themselves by failing to convert a penalty. Rory Smith did pull one back on 65 minutes, Ryan Wheatcroft restoring the two goal advantage. Harry Allen gave Rolls renewed hope, but a fourth Belper goal two minutes from time by Nick Murray allayed the fears. Mickleover Royals tasted defeat for only the second time this season as they went out of the Phoenix Trophies Floodlit Cup to Pinxton, the final score at the Raygar Stadium 4-2 to the visitors. Davy Hampson gave Royals the lead but they were pegged back by Jake Vernon and Kurtis Bamford before Steve O’Connell levelled things by the interval. Pinxton settled it in the second half, Tom Ellis and Chris Shelton putting them through to a quarter-final tie at Belper. It was a busy week in the Reserve Supreme division with all except leaders Matlock Town in action. Jack Lambert and Chaz Bradwell scored the goals which gave Dronfield Town a 2-0 win over Radford. Graham Street Prims continued their improved form with a 2-1 win at Dunkirk. James Gladwin and Mitchael Williams were both on target, Dunkirk’s goal coming from Lewis Walker. Teversal were 3-2 winners at Holbrook Sports, while on Wednesday evening Heanor Town took the points at Borrowash Victoria by a 2-1 margin. Oliver Naylor and Ryan Seale were Heanor’s matchwinners while Callum Holler scored for Vics. Pinxton and Swanwick shared the points at Wharf Road in the Reserve Premier division, Jimmy Barry netting for Pinxton, Ashley Buxton for Swanwick.